Rosich added 12 points and five rebounds of his own while propelling the Eagles in the second half. The Jones Eagles secured a key playoff win on Thursday night, defeating the Perspectives Wolves to advance to the third round of the CPS Consolation Playoffs. A tough battle in the first half kept it close with Perspectives leading 33-27. The Eagles’ zone defense allowed easy corner jump shots early which allowed the Wolves to pounce in the first half. “We came out of the gates in the first quarter with the sense that we were gonna beat them and we played really soft,” said Patrick Mattar ‘19, who provided valuable minutes off of the bench. 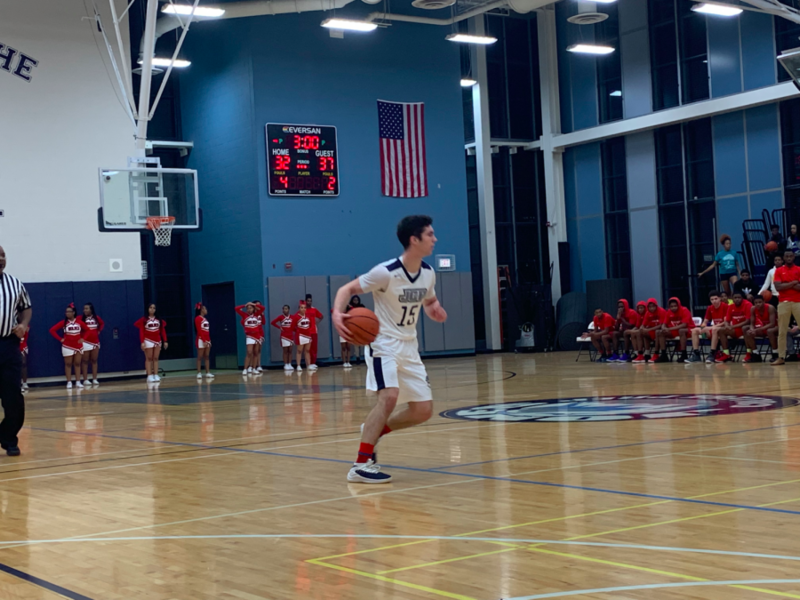 However, a late push in the third quarter by the Eagles, led by Stefan Rosich ‘19, gave them a four point advantage with one quarter to go. Rosich finished with 12 points and five rebounds, while his teammate Rron Thaci led the team with 17 points and 11 boards. Coach Jarard Nathaniel rewrote the script in the locker room at halftime, trying to change things up. The Eagles’ Nest continues to be a tough place to play on the road. Despite a seemingly small crowd in the stands, slamming of the bleachers, constant chants, and a certain energy pumped the gym, which in turn intensified every possession on both sides of the court. “[The energy] helps us on offense and defense. It pushes us to execute and play harder.” said Alex Andrade ‘19, who added four points and four rebounds in the victory. A series of missed free throws from the Wolves plagued their late-game comeback chances, building up frustration. With the game seemingly in hand with 42.5 seconds remaining, tempers flared between both teams resulting in a double technical being handed out by the officials. Rosich knocked down both technical free throws, which earned a standing ovation from the bleachers, effectively sealing the game. The Eagles’ next game is Sat., Feb. 9, against Stagg in the Homewood-Flossmoor Shootout while the CPS Consolation Playoffs are set to continue.